Is your writing right? If you want how-to information about writing, then you've come to the right place. If you are looking for more opportunities to publish your words, welcome. Who is producing this content? For over twenty years, W. Terry Whalin has published his work for more than 50 print magazines and published more than 60 books from traditional publishers. This site is Terry's way to help people who want to "write right." If you keep sending out manuscripts without a basic knowledge, then you will likely be doomed to failure. Through this site, Terry offers proven tools and methods to help you succeed. Every single link and page will focus on helping launch your career. 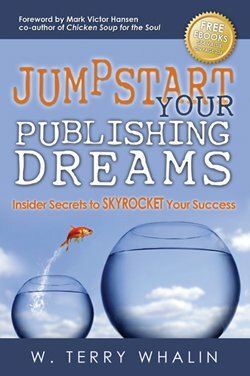 Whether you want to produce: a nonfiction book, a children's book, a grant proposal, a newsletter, a novel, a thank you note, any type of freelance writing, a magazine article, a cover letter or a resume. Move your writing into high gear in 2014. Want to sell more writing? Then learn e-persuasion. How do you get a book published? It seems like an impossible dream--yet through these pages Terry Whalin will guide you in this process for fiction or nonfiction. Reading these books to your child, it seems like anyone can write them and make money. The skill isn't simple but you can learn it. This page will start you on that journey. How Do You Get A Novel Published? If you want to write a novel, you will return to this page often to read new articles and use the resources. How Do You Get A Nonfiction Book Published? If you want to publish nonfiction, this page will be a jumping off place with many articles and links. Many writers dream of a full-time freelance writing career. This page will feature opportunities, conferences and articles to help your journey. Grant Writing is a skill to learn. To write a grant takes a certain level of knowledge and skill. This page begins this journey with some basic information and links to recommended products. While you may say, thank you, how often do you write a follow-up letter? It's a rare action and you will stand out if you do it. Here you can learn how to thank others. This page reviews the product Instant Thank You Letters and more. This page highlights outstanding web tools to help you boost the traffic and attention to your current website. Beyond the specifics, this page reviews tools for anyone with a website. Magazine writing can be your first step toward publishing a book or longer work. Start with the shorter articles and begin to learn how on this page. Write A Newsletter? Who Me? Learn here how to write a successful newsletter from professional writer and editor W. Terry Whalin and through the various articles and resources. Your cover letter makes a first impression and you want it to be a positive one. This page will provide articles, resources and links to help you make a great first impression. If you want your resume to catch the right type of attention, you've come to the perfect place to learn about resume creation and excellent writing. Writers are also readers. They do more than simply put words on the page. This page gives constantly changing resources to help your writing. Every writer needs their own website. Here you can learn about some of the best tools on the Internet. Here's where you get free articles from W. Terry Whalin on writing and insight from the lives of best-selling authors. This page provides insight to common questions from writers. The answers are from experienced professional writer and editor W. Terry Whalin.